The Huntington Cast series provides the perfect combination of grilling performance and exceptional value. The unique cast aluminum cook box provides superior heat retention, durability and will never rust. Combined with the powerful burner system, the Huntington Cast will heat quickly and maximize heat retention for cooking versatility. The Huntington Cast grill is well suited to value conscious grillers with an eye for performance. You will have confidence with this grill as it offers a 10-year warranty on the cast aluminum cook box and a 5-year warranty on the stainless steel burner. The Broil-Mate 24025BMT provides the perfect combination of grilling performance and exceptional value. The unique Cast Aluminum cook box provides superior heat retention, durability and will never rust. Combined with the 25,000 BTU burner system, the 24025BMT will heat quickly and maximize heat retention for cooking versatility. The Cast Aluminum cook box provides unbeatable efficiency and will limit temperature fluctuations during the cooking process. The Broil-Mate 24025BMT is well suited to value conscious grillers with an eye for performance. You will have confidence with this grill as it offers a 10-year warranty on the Cast Aluminum cook box and a 5-year warranty on the stainless steel burner. The Huntington Cast series provides the perfect combination of grilling performance and exceptional value. The unique cast aluminum cook box provides superior heat retention, durability and will never rust. Combined with the 30,000 BTU burner system, the Huntington Cast will heat quickly and maximize heat retention for cooking versatility. The Huntington Cast grill is well suited to value conscious grillers with an eye for performance. You will have confidence with this grill as it offers a 10-year warranty on the cast aluminum cook box and a 5-year warranty on the stainless steel burner. 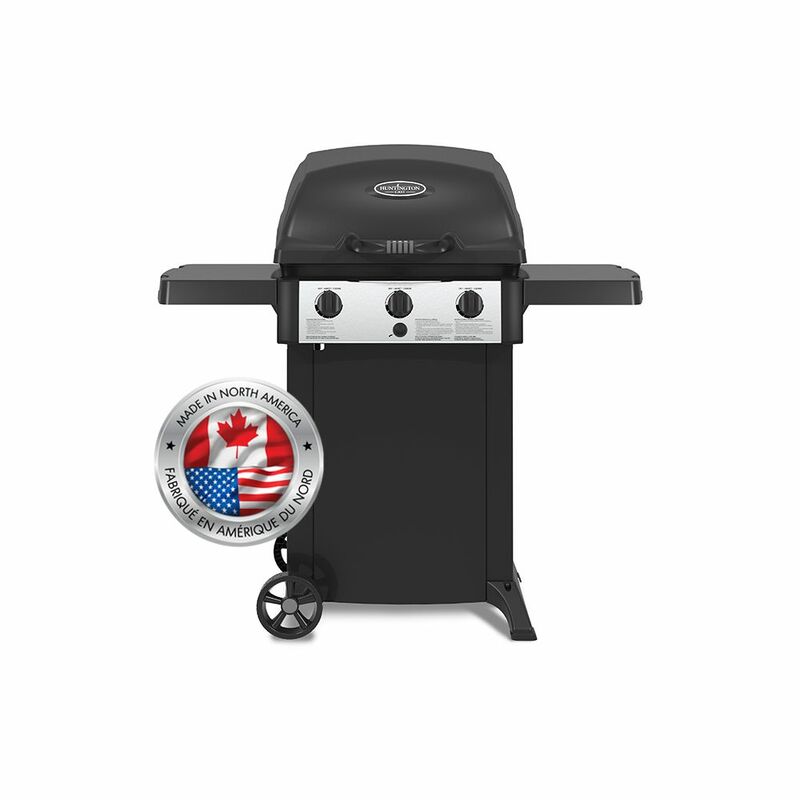 3-Burner Cast Aluminum Propane BBQ The Huntington Cast series provides the perfect combination of grilling performance and exceptional value. The unique cast aluminum cook box provides superior heat retention, durability and will never rust. Combined with the powerful burner system, the Huntington Cast will heat quickly and maximize heat retention for cooking versatility. The Huntington Cast grill is well suited to value conscious grillers with an eye for performance. You will have confidence with this grill as it offers a 10-year warranty on the cast aluminum cook box and a 5-year warranty on the stainless steel burner. 3-Burner Cast Aluminum Propane BBQ is rated 5.0 out of 5 by 1. Rated 5 out of 5 by Trisha from Excellent features, easy to light. Easy to move. I purchased this bar-b-Que recently and I am delighted with all the features, good strong castings, great size for a small area, with excellent warranties. Plus it is a Canadian product from Ontario.